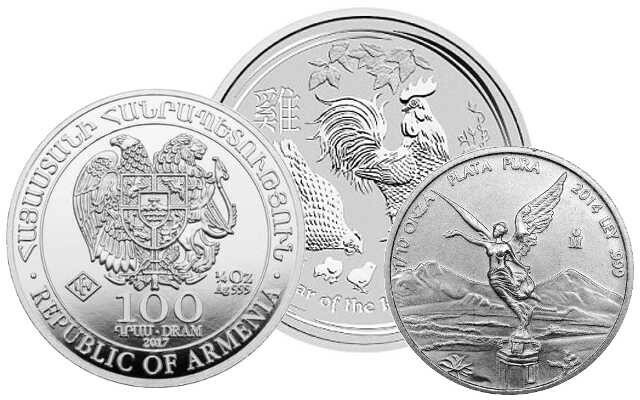 Apart from the standard coins in the range of 1 ounce, Edelmetalle direkt offers a large variety of common silver coins with a lower (troy) weight. Smaller weight units below the standard size of 1 ounce are recommended as an admixture for the case that gold and silver may again become a mean of exchange that is generally accepted, at least temporarily, because of the collapse of the paper currencies. In this case, both gold and silver would overall enormously gain purchase power so that the standard size of 1 ounce could already be too recoverable for the small things of the everyday life. Here you may find the small silver coins of the well-established manufacturers, e.g. the Canadian Grey Wolf, also called Howling Wolf, the small coins from Australia out of the Lunar II-Series, such as the Lunar II Rooster 2017 or those of the Armenian Noah's Ark-Series, but also small coins from Mexico such as the Silver-Libertad. Should the coin you are looking for be not listet, don't hesitate to give us a call. Usually, we are able to have the standard coins ready for you within 3 - 5 working days.